How do you make politics – or any sphere, for that matter – representative of the population? Do you focus on creating opportunities for minorities? Do you hope that the success of the few will simply inspire the many? Or do you positively discriminate, bringing in quotas and limiting application processes? There’s also another, specifically theatrical question about representation. In staging just such a debate as the one started above, within the specific context of black representation in British politics, Juliet Gilkes Romero runs into a problem. Factual accuracy and clarity of argument, so important in any other attempt to tell a neglected history, often come at the expense of dramatic dynamism. All exposition and no action rarely makes for compelling theatre. The difficulty is, there’s a hell of a lot of background to cover before Upper Cut can even begin to land its blows. Gilkes Romero’s play is about the struggle for black MPs in the Labour movement, a battle that threatened to split the already embattled party in the 1980s, and which for that very reason was sidelined in the attempt to get elected under leader Neil Kinnock. Subsequently, the account of that struggle and the Black Sections movement that initiated it has itself been marginalised in the telling of recent British political history. Gilkes Romero’s play is an attempt to remedy that. Upper Cut goes about addressing this history in reverse, beginning on the eve of Barack Obama’s re-election in 2012 – a handy springboard for discussing how far (or not) we’ve come in terms of representation – and gradually rewinding back to 1986. The arguments in question are dramatised through black activists Michael (Akemnji Ndifornyen) and Karen (Emma Dennis-Edwards); the former, when we first meet him, has gone on to become a career politician and deputy Labour leader thanks to his willingness to compromise, while the latter’s staunch dedication to racial equality has seen her pushed out by the party. Acting as both supporter and antagonist is Labour strategist Barry (Andrew Scarborough), who is more interested in the health of the party than he is in its racial make-up. Gilkes Romero’s play never makes the mistake of being as simple as black and white, but neither do its varying shades of grey wholly convince. After becoming involved with Black Sections at the same time, Michael and Karen each experience a change of heart – if in different directions – but we are never given enough emotional insight to fully appreciate the weight of these tough political decisions. The suspicion is that these reversals serve the debate rather than the characters, whose motivations are murky at best. 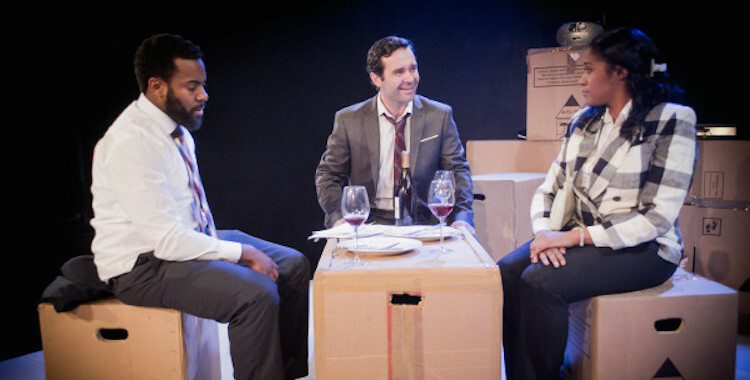 Gilkes Romero’s main concession to drama, meanwhile, is a sharp-edged love triangle between its three characters, which does little to animate either the human or the political. Directing this dramatised editorial, Lotte Wakeham does little to raise the emotional stakes. In a nod to the play’s boxing metaphor, Rachel Stone’s minimal, cardboard box dominated set puts the actors on a raised stage for the duration, but little else about the production gets close to capturing the visceral cut and thrust of the boxing ring or the political arena. The rawness of betrayal and the sting of compromise are never fully felt; there’s plenty of fight, but Upper Cut fails to quite make contact.